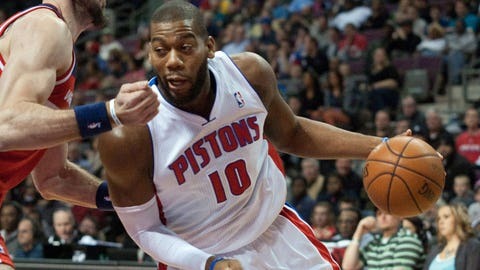 Detroit Pistons power forward Greg Monroe (10) drives to the basket against the Washington Wizards during the first quarter at The Palace of Auburn Hills. AUBURN HILLS — The Lions have finished their season, so they can’t blow any more fourth-quarter leads. The Pistons, though, still have 49 games to go. They were the Motor City’s least favorite pastime again Monday, as the Washington Wizards outscored them 28-12 in the fourth to cruise to a 106-99 victory. The Pistons are now just 6-11 at home, and have blown double-digit leads in three of their last four games at the Palace. After the game, Maurice Cheeks was nearly speechless when asked if he could explain his team’s late-game disasters. "I can’t," he said, sighing deeply. After a long pause for thought, he was finally able to come up with a bit more explanation. "We had a nice game going for three quarters, but we didn’t keep playing that way in the fourth," he said. "We got stagnant, and they just kept running pick-and-roll and kept scoring. There are a lot of times when a game just comes down to who makes plays in the fourth quarter, and we didn’t make any." Detroit was up 12 late in the third quarter, but Washington outscored them 14-0 over the next four minutes to take the lead. A large chunk of that came with Cheeks using Chauncey Billups and Will Bynum in the backcourt, as he tried to get Brandon Jennings some rest without being able to use the injured Rodney Stuckey. "I had to give Brandon a breather, plus he had four fouls," Cheeks said. "We got him back in the game with eight or nine minutes left, but we had to give him something. We trust Will and Chauncey out there." Ten years ago, every coach in the NBA would have loved to have Billups on the floor late in a close game, but it is becoming more obvious that 37 years and multiple injuries have taken their toll. 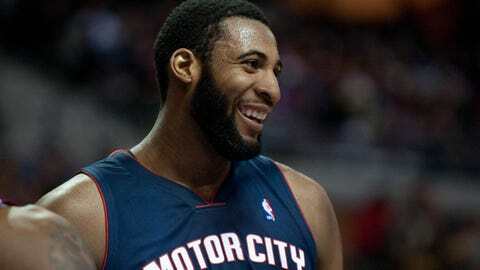 Billups has only played in 15 of Detroit’s 33 games, and hasn’t played more than 22 games in a season since 2010-11. He’s shooting 31 percent from the floor, 11 points below his first stint in Detroit, and doesn’t seem to have the legs to knock down the clutch 3-pointers that earned him the "Mr. Big Shot" nickname. He’s even struggling with routine ballhandling, committing a turnover in the open court during Washington’s big run. When Stuckey is healthy, he has given Cheeks a second consistent scorer at guard, averaging over 14 points a game as Detroit’s sixth man. He’s missed six games, though, and was out again on Monday with a shoulder problem. Kentavious Caldwell-Pope filled in nicely in the first half, breaking his career high with 17 points on 7-9 shooting, but he missed the only two shots he took in the second half. "I had a great rhythm going in the first half — it seemed like I was knocking everything down," he said. "I just couldn’t get that back in the second half. I did everything I could to get myself loose, but it didn’t happen." Detroit scored 63 points in the first half, but that was boosted by 20 second-chance points on 14 offensive rebounds. Washington took that away in the second half, holding Detroit to only four offensive rebounds, including just one in the fourth quarter. "Most of their points in the first half came on second-chance points, and they killed us in the paint," said John Wall. "We came in at halftime and said we have to rebound the ball. We did a better job of boxing out and everyone wanted to help. "We came back and fought in the second half, and we held them to 36 points. We got the lead and we closed it out." When Wall says it, it sounds simple, but like their counterparts at Ford Field, the Pistons have found themselves unable to close out leads. "When things happen to you over and over, you start to have anxiety about it," Cheeks said. "That happens to everybody about everything. We just have to overcome things and win a few of these games. "That’s what is going to solve it."